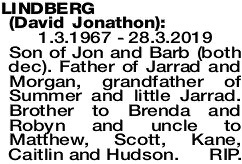 1.3.1967 - 28.3.2019 Son of Jon and Barb (both dec). Father of Jarrad and Morgan, grandfather of Summer and little Jarrad. Brother to Brenda and Robyn and uncle to Matthew, Scott, Kane, Caitlin and Hudson. RIP. 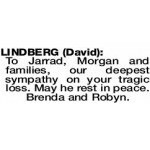 To Jarrad, Morgan and families, our deepest sympathy on your tragic loss. May he rest in peace. Brenda and Robyn. 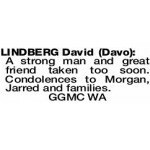 LINDBERG DAVID Our deepest sympathy to the Lindberg family and to the GGMC on the sad loss of your brother Dave we understand your pain fellas. 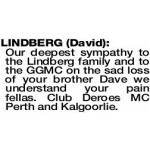 Club Deroes MC Perth and Kalgoorlie. A strong man and great friend taken too soon. Condolences to Morgan, Jarred and families.